Pa’lante’s first gig was an exciting one — we opened for the great Mongo Santamaria, and it took off from there. 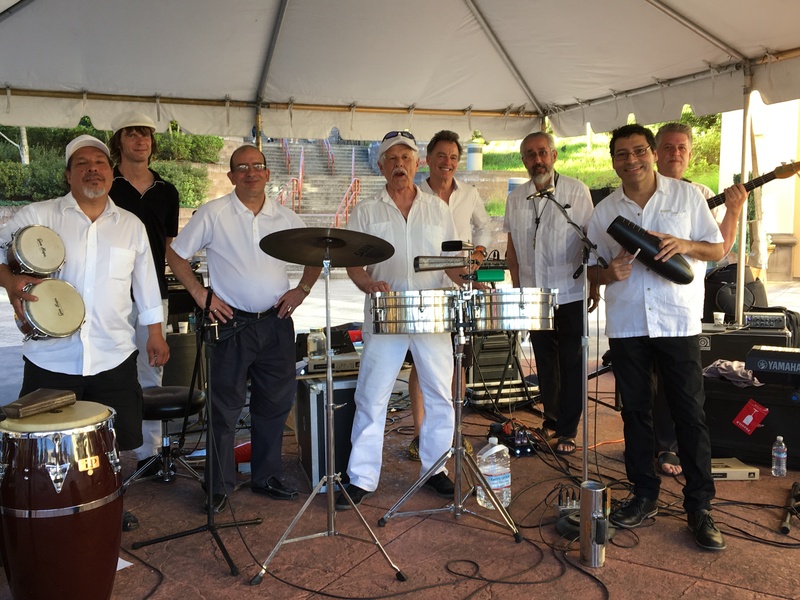 Pa’lante has a distinguished history as one of Portland’s favorite Latin bands for decades, playing Latin jazz, salsa, cumbia, merengue and timba for listening and dancing. The band has a very tight, professional sound, and features a combination of fantastic musicians from the genesis of the band, along with some outstanding new players. Pa’lante was started in 1985 by percussionist Nick Gefroh. The band evolved from Nick’s previous band “Manteca” which in turn evolved from Portland’s very 1st salsa band “Montuno”. From 1985 to 2005 Pa’lante played innumerable parties, clubs, weddings, festivals, etc. Then it was time for a break to focus on other projects. But the band members stayed in touch and in 2013 the band reunited, full steam ahead! The band is back with high energy and playing tighter than ever. Many of the original members are back. You can hear the excitement of being together again in the music. A typical Pa’lante set moves from cookin’ Latin jazz to spicy hot salsa, to cumbia, merengue, bolero, and cha cha cha, all designed especially for dancing, and even seated listeners can’t help but respond to the compelling rhythms. Pa’lante is a contraction of para adelante, translated variously as “forward!”, “straight ahead!” and “onward!”. After many years as a jazz drummer in Portland, L.A. and New York. Nick helped start Portland’s first Latin Jazz and salsa band in the mid 70’s with a group called Montuno. After that he led a band called Manteca, which later developed into Pa’lante. He took time off to travel and study in South America and recently traveled to Cuba. Nick and our bongo player Jeff are both consecrated bata players. In addition to leading his own bands, Nick has been a sideman playing all kinds of percussion in many jazz and Latin bands throughout the years, including Bobby Torres, Picante Latin Jazz, Thara Memory, Jim Pepper, Carl Smith, Felicidades, and Walter Bridges. Nick hosted KMHD’s Latin Jazz show, Thursday Night Descarga, on Portland’s jazz station KMHD, 89.1 for many years. He hosts Jazz Lives on KBOO 90.7 fm every Wednesday from noon to 2 pm. Marty plays congas and percussion. Originally from L.A., Marty is a veteran of the Portland Salsa scene. He has played for extended periods with Pa’lante, Alegre, Afincando, Agua Miel and others! Francisco is originally from Palm Springs. He is a truly invaluable player and a charter member of the band. He plays saxophone and flute. He is a talented musician, arranger and veteran of many bands including, NU SHOOZ, Walter Bridges, Felicidades and his own band, Quico. Another charter member of Pa’lante, Peter is on the trombone and violin. He has played with a variety of bands in Portland for many years, including Carl Smith and the Natural Gas, Thara Memory and is currently with the Portland Opera. He is a mainstay with the band and was dubbed Pa’lante’s “ace in the hole,” by an Oregonian reviewer. He has his own CD out called, Gut Feelings. Isa Perez is a talented Cuban singer with a fabulous voice and joyful spirit. Since arriving in Portland, she has led her own groups as well as being featured with Alegre and others. Jeff is a multiple percussionist and solid as a rock. He is a serious student of Afro-Cuban and West African drumming. Along with Nick and Miguel, Jeff has also achieved the title of “Tamborero Consagrado” (player of the sacred bata drums). Miguel Bernal is a master Afro Cuban percussionist from Havana, Cuba where he was the principal percussionist for folkloric dance company “Raices Profundas” for 20 years. Before moving to Portland, Miguel trained Conjunto Folklorico Orishaoco percussionists, and played with Conjunto Folklorico of the University of Havana. He attained the highest Cuban government ranking a percussionist can be classified as. Miguel has also been a “Tamborero Consagrado” (player of the sacred bata drums) since 1990. Miguel is in great demand as a performer as well as a teacher and currently tours around the world with Portland’s own, Pink Martini. He taught at the International School of Arts, as well as being one of the founders of Humboldt State University’s “Afro Cuba Camp,” where he continues to instruct during the summer. Pa’lante is proud and lucky to have this Cuban master join us whenever he is available! Rod started as a trombonist playing in bands around Portland. He was an original member of NU SHOOZ. Later, he switched to piano and he has played with virtually every salsa band in Portland. He grooves hard in the Latin vein. An exciting and funky bassist, Tom has honed his craft playing with all the Afro-Cuban and salsa bands in the area, including Bobby Torres, Alegre, Aguamiel, and more. Eric is a dynamic young trumpeter. He has completed a rigorous P.S.U. music program. He plays with numerous jazz and Latin jazz bands around Portland.